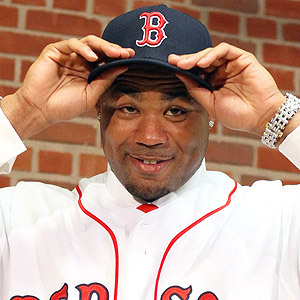 No, that picture of Carl Crawford in Red Sox gear is not a work of photoshop mastery. You are seeing what you are seeing- a workhorse taking the payday created by the current Major League Baseball system. Tampa Bay Rays fans everywhere have been straight up fooled. For the last half of a decade, we actually thought we were no longer the glorified farm system of the major leagues. I’ve lived through the Naimoli days (who I didn’t know was a Notre Dame alum), where we tried to mesh the young and cheap with the old, glorified, but past their prime. I’ve seen the Rays try to copy the Yankee formula to an embarrassingly cheapened and quite unsuccessful degree- I’m looking at you HIT SHOW years. And I’ve seen the Rays have a team full of minor leaguers who would probably have to scrounge around for playing time in other teams’ farm systems. And then it happened. New ownership. Stu Sternberg- a man with a plan. No more “Gruden-esque “deals like giving up prospects for has beens. The talent was brewing in our own system, we just needed time, and a few key trades that, while a gamble, brought in youth, and ultimately loads of potential. The rest is history. After winning 2 AL East titles and having three winning seasons in a row, it seemed like the Rays were ready to be perennial threats to the former status quo of the AL East instead of the perennial doormat. A young nucleus was in place. A starting pitching staff that could easily dominate the scene for years to come had been assembled. There are two issues. How can any GM work contracts so that almost half a roster becomes free agents at once, and also, how can you not even try to keep the face of your franchise? Offering arbitration must have been an insult to CC. But he knows the system, and he now is a rich man thanks to it. The Rays have thrived on scouting out unproven talent and signing on the cheap. I know how we operate. But you can’t help but wonder if this call for payroll reduction, and blaming poor attendance, a horrendous stadium, and whatever other factors Sternberg wants to claim are hindering the Rays franchise from competing fiscally with the big boys is nothing but a sham. It’s just a cover up. Management knew this day would come. While we made some GREAT moves, again, how can you allow for all of these contracts to expire at the same time? It’s a cover up. Slashing payroll to cover up managerial mistakes. Gotta love it. Baseball is a special game. No one really gets it like we do here in the United States. Yes, the game is played in Asia and in Latin America, but the game of baseball is by far the greatest expression of Americanism at it’s finest. Hard work yields reward. Loyalty is an afterthought. We follow the almighty dollar. But who can blame CC, Carlos Pena, Joaquin Benoit, or anyone else who is soon to find a new home with a fatter paycheck? I’ll have to accept the fact for now that Tampa is just a MLB training ground- and if we are lucky, we may get to see something special every couple of seasons. The feel good story of the 2008 baseball season may end up leaving a bitter aftertaste in the mouths of Rays fans everywhere. Rocco Baldelli, who has been the face of the franchise for many years, has signed a one year contract with the Boston Red Sox Sux. Blasphemy. Not the sort of news I enjoy coming home to. What makes this incredible to me is the amount of time the organization gave to Rocco to overcome injury (some inappropriately inflicted during the offseason) and for him to stage a comeback after being (mis)diagnosed with a mitochondrial disorder. In the 2+ seasons prior to the back half of the 2008 season, Rocco had played next to nothing, being a regular on the 60 day DL list and on injured reserve. Clearly this is a frustrating situation to be in as a player. No matter what team you are on, even if it was the Tampa Bay Devil Rays, most professionals want to play. I don’t want to take anything away from Baldelli’s accomplishments as a member of our ball club. He was many times the sole reason to drive across the bay and watch the team play in that sarcophagus of a stadium (before current renovations). I’m not sure how I should judge this. Of course, it initially comes across as a slap in the face to the efforts of the Rays organization to keep him in the game and to provide him hopeful support. Then again, could it be that someone in the front office really messed up? Or perhaps this was to be expected when Rocco filed for free agency after the season. Did we not up the ante when it came down to it? I definitely think the chance to play closer to where he grew up was a huge factor as well. I can’t help but think that the signing of Pat Burrell only expedited the process. Nevertheless, we will miss you Rocco. You will always be remembered as a legendary Ray, and as an essential part of the eventual success of the franchise. I’ll try not to boo too hard when they announce your name when you visit the Trop. Happy World Series Eve. Just a quick blurb here congratulating the Rays on an amazing American League Championship win! The boys won the pennant at home against the indefatigable Boston Red Sox in 7 thrilling games. The World Series starts tomorrow at 8:30 or so… and it will be on FOX, so no worries if you don’t have cable! The Rays take on the Philadelphia Phillies in what should be an epic series. A lot of people focus on the Cubs not winning the Series in 100 years, but Philly has won it ONCE in 126 years! That’s absurd. As for me, I will actually be at the game! Thanks to a good frend of the heap., I was able to purchase an outfield ticket! What a historic event to go see, and the pitching match up isn’t too shabby either. Cole Hamels vs. Scott Kazmir. I’ll definitely have pics and stories to share! Look for many updates this weekend!